What makes the Chicago Brand wrench different? 1. Made of Stainless Steel (17-4pH). Most wrenches are made of hardened vanadium carbon alloy steel. 17-4 stainless steal is widely used in aerospace and many other industries. Its limited hardening capacity (usually up to 38R.C. and rarely 40R.C.) makes it an ideal stainless steel tool. 2. Most wrenches are mass produced and chrome plated. Our wrenches are not chromed nor cadmium plated, which is a basic requirement for aerospace industry use. Chrome plating creates a shiny and appealing look when new. However, chrome chips will eventually form from tool usage. Chrome chips can interfere with sensitive mechanical and electrical function. The shine you see on our wrenches are a result of hand polishing. All wrenches are individually hand polished. Our wrenches may scratch somewhat easier compared to chrome plated wrenches, however re-buffing can always bring back the shine. 3. 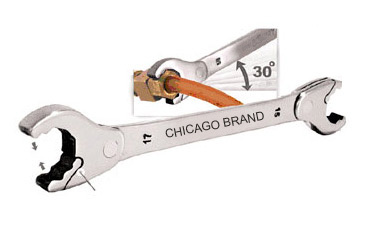 Chicago Brand Ratcheting wrenches do not need the hardness of most commercially available wrenches. In order to work, wrenches should be very hard and form a close tolerance fit with its equivalent fastener size. CB wrenches are softer by -1 to -2R.C. Their unique interactive design creates a prying-like action of a fulcrum that transfers the force applied to the handle as a gripping action to the fastener. Because they grip increasingly more as more force is applied to the handle, they grip better than most regular open-end wrenches. 4. Only 30º of room needed to ratchet. Most open-end wrenches need a minimum of a 60º swing angle to ratchet. Our wrench requires only half of that at 30º of swing because of the patented design. Coupled with small head size and a design with increasing interactive grip---it sets a high standard in the open-end ratchet system.